A new drinks concept has been created by UK-based international wine business consultancy Litmus Wines. 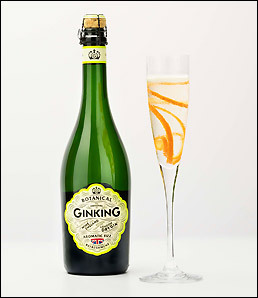 Its concept, Ginking, melds the botanicals of gin with English wine and spring water. Targeting both millennial and traditional gin drinkers, Ginking is a light and refreshing low alcohol (8.5%) pre-mixed sparkling beverage, best served in a flute with a twist of orange peel. Ginking is the brainchild of John Worontschak, founder and director of Litmus Wines. Worontschak says: “I was sitting in the garden one evening with my wife who was struggling to choose between a G&T and a glass of English fizz. She challenged me as to why you couldn’t have both, and the idea was born." Ginking’s packaging has been designed to emulate traditional British Victoriana-style gin cues, with pictures of the botanicals on the back label, in a 75cl sparkling wine bottle topped with cork and metal cage. The history of the brand is also highlighted in a lighthearted story on the back label. John Worontschak founded Litmus Wines Ltd in 2008. The team at Litmus consists of Worontschak, production manager Matthieu Elzinga, sales manager Nick Connell and general manager Michael Florence.